The Year was 1934 in the heart of the depression. President Franklin D. Roosevelt and the congress had established the Civilian Conservation Corps for boys ages 17 to 25. In the spring, Company 927 (approximately 400 boys) arrived at Belknap Camp near McKenzie Bridge, Oregon. Most of them had never seen mountains before. This group of city-bred youth (Chicago and St. Louis residents, mainly) with the help of Forest Service personnel and specialized craftsmen erected White Branch Lodge, built a water system, and cleared the ski run. Alternate projects suggested for the funds were: an airport for McKenzie Bridge or a ski lodge at a higher elevation, near Alder Springs Campground where good snow conditions would prevail a greater percentage of the time. The Obsidians, a Eugene-based mountain climbing and search and rescue group, had proposed the site chosen. Their meeting place was at the J. O. Lewis cabin in the small meadow, near the lodge. J.R. Mitchell was general superintendent of the project, Scott Taylor, head ranger, and Perry Thompson, Willamette National Forest supervisor. Bill Parke designed the building. Eventually, the lodge will be designated a historical site and renamed Monroe Lodge in honor of Warner Monroe, educator and mountain climber. White Branch Lodge opened Jan. 1, 1935, with 1200 people to help celebrate the occasion. The Obsidian Club held the first lease. John Miliron was in charge of rentals – skies and toboggans. Roaring fires in the huge lodge fireplaces provided warmth and the snack bar had a fire also. Probably oil lamps provided lighting for the structure. Dr. John F. Bovard presided at the informal dedication service. Forest Service Supervisor Perry A. Thompson presented the playground and its facility to the public. Arthur Hendershott accepted for the City of Eugene, J.O. Holt for the Chamber of Commerce, and Dorr Hamlin for the Obsidians. Obsidian Princess Florence Sims was crowned queen with a snowball by Thompson. Some years the skiing was good, other years not as good. One season a portable rope tow was brought in. The Obsidians continued to use the lodge, its sleeping loft and cooking facilities until 1948. Many winter outings were begun at White Branch – mountain climbs, McKenzie pass treks and cross-country jaunts. In consideration of the vital importance of our rapidly growing youth camps, it is becoming more and more apparent that our district should provide a suitable place of our own. The committee met last September and went to the White Branch Recreation Area to survey its suitability. During the conference with the lessee, Marvin Dow, the committee learned that he was willing to turn the lease over to us. Some $2,000 was spent last fall in improvements, and plans have been laid for the erection of essential buildings in early summer of this year, in order that our youth camps may be held on our own grounds in August. We now have a ten-acre tract, leased to us by the U.S. Forest Service. To the large, rugged ski lodge on this property has been added a new building which provides a dining hall and kitchen, also dormitory space for approximately forty. Other smaller dormitory units are planned. Our first camps were conducted last summer beginning with the boys, 147, directed by Lowell C. Ellis. Ruth Mack led the girls’ with 137 enrolled. Many long sacrificial hours were donated to make the camps a reality. The concept of a District Center had been gaining support for several years and finally came to a vote at the 1957 district assembly. The decision was to make Clackamas the site for the District Center and to locate all district meetings, camps and camp meetings there. Thus ended an eleven-year era for the church’s youth. In our get-acquainted session on the first night of camp I was apprehensive about after-hours control since it was so easy to slip out of sight in the trees. My announcement was something like this: “Following campfire we will prepare for the night’s rest. It is expected that campers will go to their respective lodgings immediately and stay there for the night. I want you to know that we have no guards to keep you in your places except the mountain lions that roam these hills. We have no night watchmen to insure that you do not wander from camp except for the bears nearby.” Needless to say, we had no nighttime disciplinary problems. It was almost time for “lights out” when Dave Wardlaw came to my cabin. One of his boys, Ken Cotton, was missing. Fearing the worst, we formed a human chain into the woods, calling his name as we circled, until 2 a. m.
Shortly after daylight six or eight men with “walkie-talkies” and dogs organized a search. The men were about ready to start when one of the dogs took off barking on the trail to the beaver dams. We followed on the run. Ken came walking along, unconcerned about the furor he had caused. He had enjoyed himself at the beaver dams until he noticed it was getting dark – too dark to follow the trail. He quickly pulled up a large pile of ferns and grass to cover himself. He slept soundly for some of the searchers had gone to the dams and called his name. When his parents and pastor arrived, he assured everyone he was okay and would stay close to his group the remaining 24 hours. Youth and leaders jubilant! 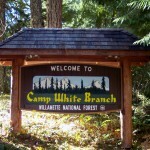 State association purchases Camp White Branch. Caretaker wanted for the youth camp, approximately 12 weeks, June through August. Lodge at White Branch; vacation while you work. Howard Baker chairs the Camping Committee; Ted Skinner is state youth president. First cleanup day scheduled May 17; first camps – Senior High, July 14 – 19; Junior High, July 20 – 26. White Branch looking for all-year caretaker. Pool construction is in progress. Junior Camp attracted 80; Junior High, 114; and Senior High, 116. Sally Stuart was lifeguard. Mensha Corp. sells ‘whole kitchen’ to camp for $1,000 -10 tables and benches, large stove and fan, dishwasher, two-basin galvanized sink with drain board, two-basin restaurant sink, work table, meat slicer, meat block, power mixer, tableware and much more, including a washer and laundry sinks. Garlin Hall bags a small bear. Keller Lumber of Roseburg donated 1800 board feet of 2 X 4’s; Raymond and Casteel, three barrel stoves; Eldo Miller hauled cement and gravel. New signs and new fees – Tubes and saucers for rent; skis and toboggans no longer permitted on slope. Snack bar ready for use; sanitation building started. We lived in the dining hall our first two months at White Branch, sleeping in the little room now used as a pantry. When we woke one morning with snow on our bed, we decided it was time to move into the 12′ X 18′ caretaker’s cottage. Sometimes there were as many as 11 people sharing the cottage with us at mealtime. Wade had plumbed-in water from the front of the lodge and built more cupboards and shelves to make better use of the little space. Our overflow was stashed in cabin #1 during winter, and moved into our summer ‘guest house’, a tent pitched near the cottage, during camping season. In winter, we took baths in a tin tub before the fire and warmed bricks for our beds. It brought back pleasant memories. Evening walks became a habit. We enjoyed the many deer and other animals except the civet cats. Wade ‘dispensed with 43 of them, mostly by trapping. Besides the on-going needs, equipment repair and wood cutting, front and kitchen porches were added to the dining hall, gutters to the pool; Roseburg church sent kitchen counters and McKenzie Sawmill donated lumber. Many people helped, including campers. We consider our time at White Branch as four years well spent. We enjoyed our periods of aloneness and we found real pleasure in serving and sharing with the campers. Two lasting mementos grace our home, a desk pen set in a burl and a Manzanita lamp – gifts from campers. A group of junior-highers were in camp for a week. Their leader, a woman in her forties, had come to the house carrying her small dog. She was telling my father they liked to sleep out the first night and wanted to know where a nice campsite was. My father walked over to the door to show her that about two-thirds the way up the toboggan slope off to the left was just the place she was looking for. It was then he saw the visitor. A large brown bear had wandered out into the clearing and was just sitting there. There were many interesting happenings during those years – finding bear tracks on the dining hall floor, feeding deer at the salt lick by the house, and the Pine Squirrel bringing her young to feed on our offering of nuts. Best of all, I remember the many decisions for Christ that were made. I can still see the many young people kneeling around makeshift altars during services held out among the trees. My parents and I are thankful that we were able to serve the Lord in this way. That in providing care and maintenance for the camp we were a small part in helping these young people find Christ. Life was interesting and completely unpredictable at Camp White Branch. Like the caretakers before us, we were plagued with civet cats – in the house and attic, empty oil drums and garbage. One, baited into the garbage can, was quickly covered and removed. Another civet was shot with a bow and arrow in the attic. Two weeks later I opened a sealed tin of instant potatoes. We could not eat them; they tasted like civet. Hunters down in the swamp sent a bear scurrying up the hill and into the tree in our front yard. He was a perfect target and made a beautiful rug. One evening a faint light on the hillside sent Alvie out to investigate. A brush fire earlier in the day, thought to be fully out, had flared. One emergency call came from a camper. Something was wrong with the heating stove. The cabin was full of smoke. She had built her fire in the cook stove’s oven. Springfield Church bought a Franklin stove for the cottage, and Harvey Buckle and Alvie purchased the propane lights. We had been using gasoline lanterns. We worked hard but felt it was worth all the time and effort. Camp White Branch was a great, growing, family experience – a lot of work, but also very rewarding for us. It has effectively shaped our children’s future in servant-hood for Christ. We have memories of sharing together – like the day “Mr. Nubbins,” a beautiful deer, walked into camp. He had only three-inch nubs for antlers, but by fall that year he was a seven-point buck. He visited us regularly, all summer. We enjoyed the new snow; in the quiet you could “almost” hear it land. But, probably the greatest thrill of all was to hear so many say; “I can feel the presence of God here.” Others could only express the feeling of “absolute peace” or “This place has a special feeling about it, like some great being is here right now.” All know God had a special hand in White Branch. As to improvements, with the installation of electricity by underground cable from Blue River, and a radiophone, the camp prepared for change. All managing, scheduling, bookkeeping and other office work were transferred from various places in the state to the camp. A newly purchased cat and backhoe helped facilitate laying of underground cable and burying water lines below freeze-level. Electrification made possible the new Nurse’s Station, an up-to-date First Aid Unit at the base of the slope, and an intercom system. And, it dispensed with a noisy, smelly generator and boilers. Electrification and weatherization, hand in hand, have brought about many needed improvements. We saw a lot of barriers crossed in that informal setting – barriers of doctrines and creeds – as Christians met and accepted each other as brothers and sisters. It was exciting to be a part of this growing process. We made many friends from the various groups. Our work, considered by us as a ministry, was to offer the best we could muster in lodging and food so the real purposes for camps and retreats could be accomplished. We drew on our restaurant backgrounds and nutrition training to provide the campers good home-style food. 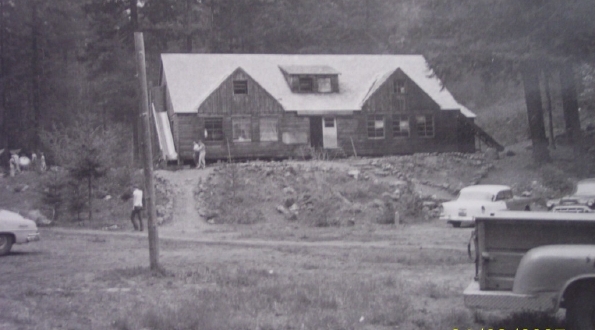 During our tenure, the back wall of the lodge and both side walls of the snack bar were replaced; cabins one, two and three received new wiring and sinks; and the dorm was rewired and sheet rocked. Also, snowmaking equipment was purchased and installed. Besides special projects there were always a host of details involved in running camps, outdoor schools and snow play; maintaining facilities and equipment, and working relationships with the church, Forest Service and the public. Our stay at White Branch has given us many memories to treasure and friends we’ll never forget. We worked hard but found fun and enjoyment in it. Writing down the impressions one has of three years of service at White Branch is no easy task. Where does one begin to note the many things that combine to make a camp operate? Persons dealt with and problems overcome tend to blur into an inseparable mural of the camp. Work parties and projects accomplished (like a new water system) stand out, but do not hide the many memories of individuals and small groups who have thrown themselves into maintenance projects with such devotion and effort that nothing seemed impossible. Above all work stands this one great purpose: that this is for the Lord, not for anyone’s self glory. The entire operation would cease to have any meaning were it not for that purpose. The only way to sustain a place like White Branch is to underwrite it with unending prayer. One’s constant purpose has to be that this facility might reach people, particularly young people, for Jesus Christ. Our commitment to good stewardship must be an ongoing and clearly defined objective; that the resources put into this work by the church be well spent on kingdom work. This pretty well sums up our thoughts about our tenure at the camp. It has been very interesting and rewarding thus far; we pray that it will continue during the rest of the time we spend here, however long that might be.